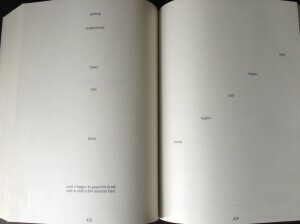 Our group chose to tackle House of Leaves by Mark Z. Danielewski for the encoding challenge. 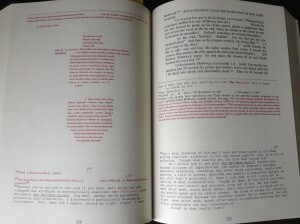 House of Leaves is a deeply complex novel, both in content and form. It is a description of a documentary film, written as a fragmented manuscript by a blind man named Zampano, which is compiled by a young man named Johnny Truant, whose own story unfolds in a series of footnotes, and the whole is commented on by nameless Editors. The documentary is about a bizarre house inhabited by a fictional Pulitzer-prize winning photographer, Will Navidson, and his family. After moving in, the family discovers new spaces appearing inside the house. The interior appears to be larger than the exterior. Passages lead into endless dark spaces full of branching ways, an enormous spiral staircase, and an ominous growl. Navidson and his brother take photographs and video of the phenomenon, eventually taking a documentary film team to explore the recesses of the house. I always think about this book when considering form and format. It was the first book I read that really played with the link between form and content. Some of my favourite pages in the book arrange the text to reflect Navidson’s physical journey through the house while describing it. However, those passages have too much form and too little content for this assignment. There are several pages we considered for the encoding project, each having their own challenges. 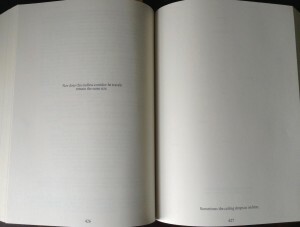 The pages below were an option that we didn’t go with. Page 336 begins in the middle of a footnote to the main text, where Zampano is quoting another scholar’s interpretation of the documentary. Most of the footnote is struck out, and the main text itself on the next page has been damaged and burned, which is indicated by square brackets enclosing blank space. The destroyed text compares Navidson’s house to Minos’ mythological labyrinth, infamous home of the Minotaur. Page 337, meanwhile, describes the deaths of some members of Navidson’s documentary team, followed in the footnotes by Zampano’s scholarship and Johnny Truant’s reflections. The content of these two pages are in fact a complex web of referentiality, while the form is an equally complex mix of layout and design elements. With any part of this book, the content is mostly nonlinear, which is a real challenge for encoding. While I have been treating Zampano’s manuscript as the main text in this post, this is really only my interpretation. Johnny Truant’s spiral into paranoia and madness could be equally or more important to some readers. Essentially, all parts of the book are equally important in terms of meaning, and so translating this into hierarchical XML requires implementing a specific reading of the text. Our group is currently figuring out an interpretation of our chosen passage, which is not as visually complex as this one, but is quite complex in its content.